In the wake of last month’s marches for science and climate in Washington and around the country, Americans are divided in their support of the events’ goals and their sense of whether it will make a difference. In particular, a new Pew Research Center survey finds that most Democrats and younger adults are convinced that these public events will help the causes of scientists. By contrast, Republicans and older adults believe the marches will not raise public support for scientists, aid efforts to increase government funding of science, enhance the role of scientists in policy debates or lead to increased efforts to combat global climate change. Overall, 44% of adults think the protests, marches and demonstrations will boost public support for science, while an equal share believe the protests will make no difference and 7% believe the demonstrations will actually hurt the cause. But on this and other questions about the marches there are consistent divides along political and generational lines. For example, 61% of Democrats and Democratic-leaning independents believe the marches will increase public support for science, while only 22% of Republicans and those who lean Republican say the same. Instead, 60% of these Republican backers think the protests will make no difference, compared with just 32% of Democratic partisans who think that. 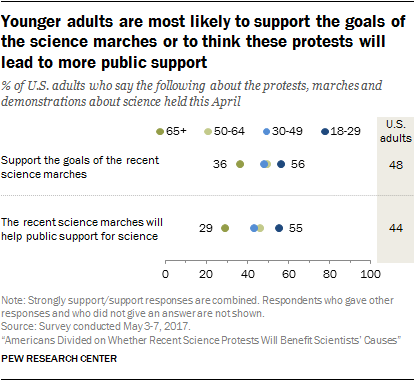 Younger adults (ages 18 to 29) are particularly likely to think the marches will increase public support for science (55%). In contrast, 54% of seniors 65 and older believe the recent science marches will make no difference to public support for science; just 29% say the marches will help. These are some of the findings from a Pew Research Center survey conducted among a nationally representative sample of 1,012 adults, ages 18 or older from May 3-7, 2017. The March for Science, which took place on April 22, stemmed from a Reddit thread made on President Donald Trump’s inauguration day. A number of groups were involved in planning the event held in Washington, D.C., and some 600 other locations around the world. The People’s Climate March was organized before the 2016 election and held April 29 to voice support for action to address global climate change. Rather than being in support of one specific policy outcome, marchers said there were a number of reasons they participated in the two science marches held in close sequence at the end of April. 73% of Democrats and independents who lean Democratic think the marches will encourage scientists to be more active in civic affairs, while Republicans and those who lean to the GOP break the other way: 52% think the marches will not be effective in encouraging more activism by scientists. 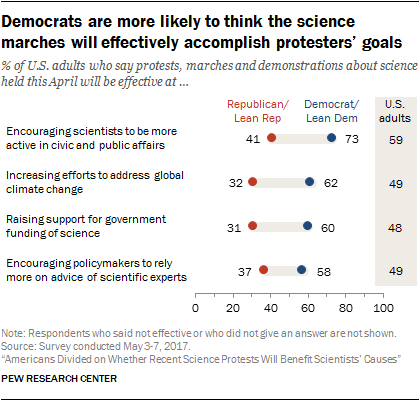 60% of Democrats and Democratic leaners say the protests will be effective in raising support for government funding of science, while only 31% of Republican and Republican leaners hold this view. 58% of Democrats and independents leaning to the Democratic Party say the marches will be effective in encouraging policymakers to rely more on the advice of scientific experts, compared with 37% of Republicans and Republican-leaning independents who think that. 62% of Democrats and Democratic leaners say the demonstrations will be effective in increasing efforts to address global climate change, while just 32% of Republicans and Republican leaners agree. By one main measure, the marches about science have registered with Americans: They have drawn a share of public attention. 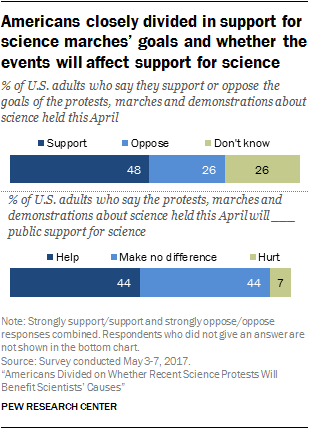 Roughly six-in-ten Americans say they have heard a lot (24%) or a little (37%) about the protests, marches and demonstrations about science held this April. More than a third (37%) say they have heard nothing at all. Overall, 48% of Americans say they “support” or “strongly support” the goals of the pro-science marches, while 26% “oppose” or “strongly oppose” the goals of the demonstrations and 26% say they don’t know how they feel about them. Support for the goals of the science marches is divided by political party. 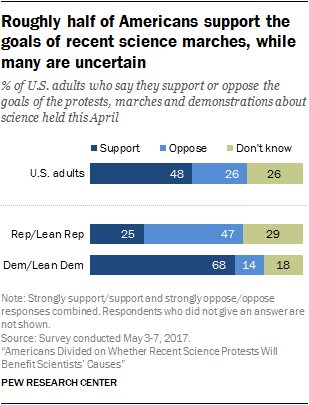 Republicans and Republican leaners oppose the goals of the science marches by a 47%-25% margin; some 29% are undecided about their views. Democrats and Democratic leaners support the goals of the marches by a 68%-14% margin, with 18% undecided. People who have heard about the recent science marches are largely supportive of the protesters’ goals. Those who have heard at least a little about the recent science marches support the goals of the science marchers by a margin of 61% to 27%. Americans are closely divided on the issue of whether the marches will increase public support for science: 44% think they will help and 44% think they will make no difference. Another 7% believe they will hurt public support. 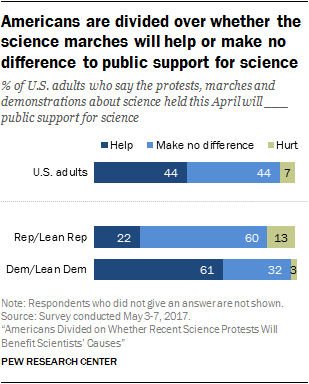 Most Democrats and Democratic leaners (61%) believe the marches and demonstrations held in April will benefit public support for science. By contrast, just 22% of Republicans and independents who lean to the GOP say the marches will help drive public support for science, while six-in-ten (60%) of this group believes the marches will have no impact on public support and 13% say the marches will hurt public support. While there are sizable partisan divisions on these issues, the differences between younger and older adults are also striking. When it comes to backing the goals of the protesters, 56% of those ages 18 to 29 “support” or “strongly support” the goals of the marchers, while just 36% of those 65 and older say they back the goals of the marchers. 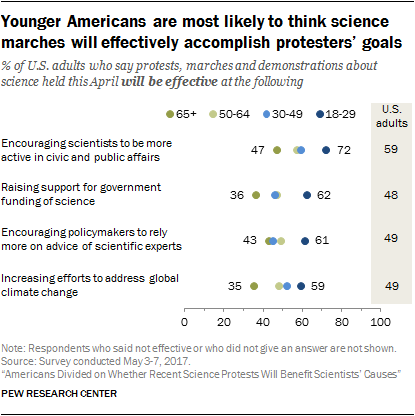 And in terms of perceived impact, 72% of those ages 18 to 29 think the marches will encourage scientists to be more active in civic affairs, compared with 47% of those ages 65 and older. Some 62% of younger adults believe the protests will raise support for government funding of science, while only 36% of those 65 and older say this. Additionally, 61% of younger adults think the protests will encourage policymakers to rely more on the advice of scientific experts, versus 43% of adults 65 and older. Younger adults are also more likely to think the protests and demonstrations will lead to public support for science: 55% of adults younger than 30 believe the recent marches and demonstrations will help public support for science, compared with 29% of those ages 65 and older. These differences by age hold even when accounting for the tendency of older adults to identify with the GOP. There are no notable demographic differences in views about the recent science protests by gender or education. President Trump’s election signaled major changes to federal policy connected with science, particularly for climate and environmental policies but also for funding science research at NASA, the National Institutes of Health and other federal agencies. Many in the scientific community have voiced concern about Trump’s views about science issues, particularly childhood vaccines and climate change, and have raised concerns about the appointment and role of science advisers in guiding policy decisions in the coming years. Asked whether the pro-science demonstrators were driven to act by the Trump administration’s handling of science issues, 48% say they think opposition to Trump was a major reason people participated, 22% say it was a minor reason, 17% say it was not a reason at all and 13% say they do not know. Fully 63% of Democrats and Democratic leaners say opposition to Trump was a major reason for marchers’ participation, compared with 36% of Republicans and Republican leaners who say this. 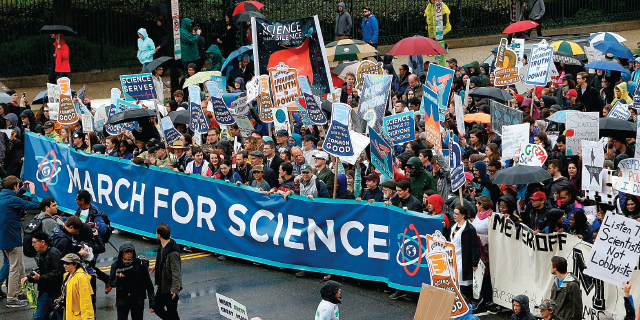 Those following news about the recent science marches are particularly likely to believe that opposition to the new administration’s handling of science issues is a motivating factor for the recent protests. 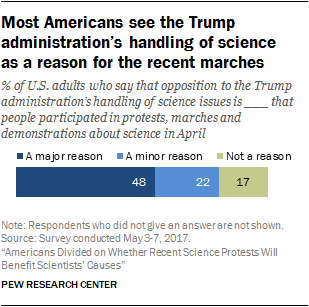 Some 55% of those who had heard at least a little about these marches say opposition to the Trump administration’s handling of science issues was a major reason for the protests, compared with 37% who had heard nothing about these science marches. 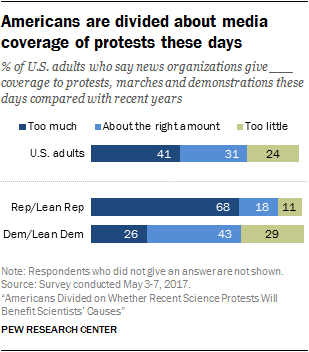 When asked about news coverage of protests, marches and demonstrations these days – whether the cause is related to science or something else – 41% of Americans say the media give too much coverage to demonstrations these days compared with recent years, 31% believe the coverage is about the right amount and 24% think there is too little coverage. Here, too, there are differences in views by party and age. Fully 68% of Republicans and Republican-leaning independents think there has been too much media coverage of demonstrations, while 18% think the amount of coverage has been about right and 11% say there has been too little coverage. By contrast, 43% of Democrats and Democratic leaners think there has been the right amount of coverage, 29% think there has been too little and 26% say there has been too much media coverage of demonstrations these days. Half (50%) of those ages 65 and older believe there has been too much media coverage of protests, marches and demonstrations these days; in contrast, 34% of those 18 to 29 think there has been too much coverage.